In 1956, Congress endorsed a program to revitalize the National Park system. Dubbed "Mission 66", it was a 10 year program of funding specifically aimed at upgrading this nation's National Park system. Isle Royale National Park sought a dynamic new vessel to replace the wood-hulled Ranger II, a surpluses World War II army mine-layer. Congressman John Bennet of Ontonagon, Michigan, sponsored a bill to fund the construction of a new vessel for Isle Royale, Lake Superior service. The bill was passed and the National Park Service contracted the firm of R.A. Stearns Inc. of Sturgeon Bay, Wisconsin to develop the design that we see today. The construction contract was competitively bid at 1.2 million dollars and awarded to Christy Ship Inc. of Sturgeon Bay, Wisconsin. The keel was layed on January 23rd, 1958 and the hull and superstructure, minus engines, was launched six months later on June 21st, 1958. The new vessel was completed and delivered to the Park's dock in Houghton, Michigan (with Congressman John Bennet onboard) on September 27th, 1958. The first trip to Isle Royale National Park on October 6th saw Gale force winds causing it to divert to Thunder Bay, Ontario to seek shelter. The trip continued the next day without incident. At 165', 34' beam and a lightship displacement of 650 gross tons, the Packet/Tank vessel with raked bow and canoe stern carries 125 passengers, 100 tons of dry and reefer cargo, 7,500 gallons of Grade "E" oil cargo and self-unloads with a 3.2 SWL (safe working load) deck crane. It was originally powered by twin 614 hp Kahlenberg direct-drive, two-stroke diesel engines but after more than 40 years of continous service, it was recently repowered in the last quarter of 1998. It is now powered by twin 850 hp, 3508-B CATERPILLAR main engines also driving hydraulic pumps for the new 250 hp bow thruster. This 1.8 million dollar contract was also competitively bid and awarded to Bay Ship Inc. (aka Christy Ship Inc.) of Sturgeon Bay. It operates with a crew of 6 in freight status and 9 in passenger service. 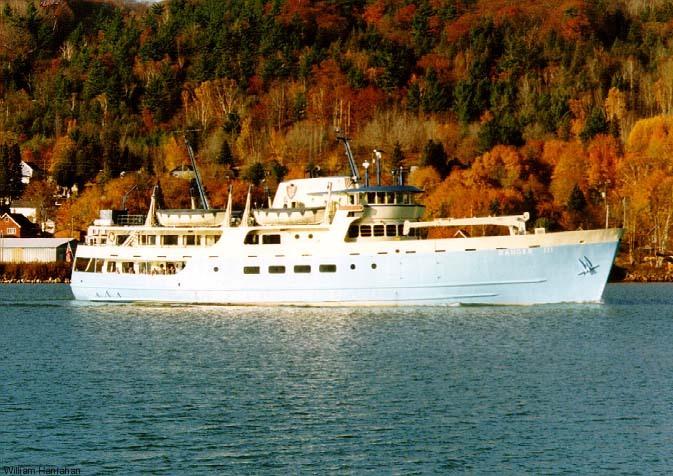 The vessel's mission continues to be "the logistical support of Isle Royale National Park" and should see an additional 25 years of service with the new engines.